3. Play on the computer. 4. Watch a movie or TV show with my family. 5. Go out and eat. 6. If I'm on vacation at the ocean - take a walk on the beach. 7. Sit in the swing in our back yard and talk (or just be quiet) with my hubby. 8. Sit in the rocker on the front porch and talk (or just be quiet) with my hubby. 9. Take a walk and listen to my MP3 player full of praise and worship songs. 10. Work a jigsaw puzzle. Join us at OhAmanda's site for more top ten Tuesday Favorites. It's fun to do that every once in a while. Hope you all had a great weekend too!! This is from my trip to Washington DC a couple years ago. 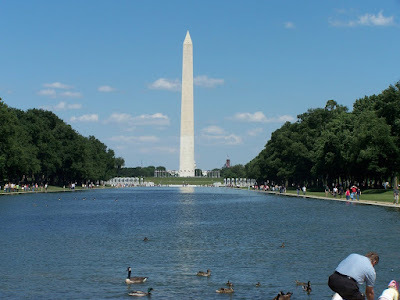 I was standing in front of Lincoln's Memorial and took this picture of the reflecting pool and Washington's Monument. You can also see some of the National World War II Memorial. I love this place and I hope to go back some day. If you click on the picture you can see it larger. If you'd like to see pictures of other skies from all around the world, click on the SkyWatch button above. My brothers and sisters and me! This would have to be about 1962. 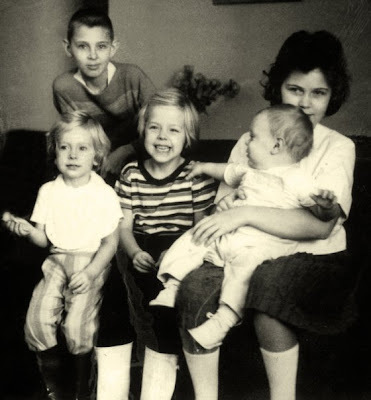 That's my older brother in the back, my little sister in the striped pants, me in the striped shirt, my baby brother is sitting in my older sister's lap. Dig those fancy boots my sister and I are wearing. I mean were we stylin' or what? I love my brothers and sisters. In honor of OhAmanda's Disney Cruise Tomorrow (did you get that? she leaves tomorrow!) I'm listing my Top Ten Favorite Things at Disney World. Understand that I love almost all things Disney. But here are 10 that I'll list and they are not in order. This is just the order the pics downloaded. 1. The Animation Academy at Disney Hollywood Studios - They help you draw one of the Disney Cartoon Characters Step by Step. So much fun. 2. EPCOT - I love Space Ship Earth (we call it the Epcot Ball). They've redone this ride and it's a fun, calm ride for the whole family. 3. Toy Story Mania - This is also at Disney Hollywood Studios - Brand new interactive ride. Love it! 4. Splash Mountain - This is a fun ride as long as you like to get wet. In Florida, in August, oh yeah! I want to get wet!!! 5. Soarin - Another ride at EPCOT. It simulates hang-gliding over California. Love this so much!! 6. Buzz Lightyear's Space Ranger Spin - Very fun interactive ride at Magic Kingdom! 7. Main Street USA - Love this and the first glimpse of the Castle. Very magical!!!! 8. Magic Kingdom - Love walking up to the entrance and seeing this. I think this is supposed to be one of the most photographed spots in the world. 9. Cinderella's Castle - How could anyone not love this!!! Aren't all us girls Princessess at heart? 10. Pop Century Resort - We've stayed here twice and love it. Such a fun place. Come join us for Top Ten Tuesday at OhAmanda's and also wish OhAmanda a great trip!! If you want to see more of my pictures and hear about our August 2008 trip to Disney, go to my sidebar and see the green DISboards button. In the narrative there is a link to our story. A few weeks ago my youngest got her ears pierced again. The first time she didn't let them heal up enough, I guess. She wore a pair of earrings that were too heavy, plus she pulled on them all the time and ended up with a slit instead of a hole. So for the last year or so she's been letting that heal. It's done pretty well, so we had them re-pierced in a little different place and they are doing really well. It's been about 3-4 weeks. She looks so cute with her ears pierced. Of course she's cute when they're not too. We went Geo-caching today to five different places. We found 3 of the 5. Well, actually I should say my oldest daughter found 3 of the 5. I have been a part of 8 different finds, but have yet to find one myself. One of these days I will though. If you want to know more about geo-caching click on the button down towards the bottom of my sidebar. Here's a picture of KLS looking in a tree for one of them. We never could find this one. Note to self, get a good flashlight so you can see in the holes. It's a little scarey sticking your hand in places you can't see. Could be little critters or spiders. Yuck!! This evening the girls attended a progressive dinner with their youth group. While they were doing that, hubby and I got a sandwich from Subway and found a place to eat it and then went driving around the area where he grew up. It was a lot of fun seeing how some things have changed and some have stayed the same. It had been years since I had been out there. About 2 houses down from where he used to live we saw this in the yard. Yes, it was real!! It's an albino squirrel. How cute is that? I just wish my zoom was a little better. If you click on the photo it should enlarge so you can see the squirrel better. Then I caught a picture of the sun going down. All in all it's been a good day! . Here's a beautiful summer blue sky at Walt Disney World taken in August 2008. I just needed to see me some summer sky at my favorite place! To see other beautiful skies all around the world click the SkyWatch Friday button above. 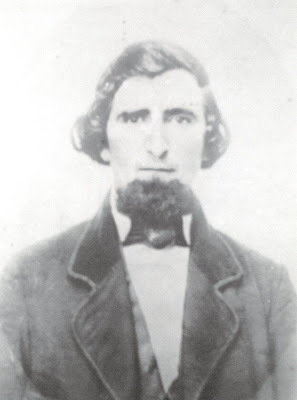 This is my great great grandfather. He came over to the United States from Germany with his brother, Frederick. I've heard that the brothers were stow-aways on the ship and I've heard they worked their way across the ocean. I don't know which is true. Anyway Johann married my Great Grandmother, Sophia. They lived in Kentucky at the time. They had a son named Wilhelm and he worked in a Blacksmith Shop. In fact my dad has a photo of him standing out in front of the shop. The original was a tin type photo. Dad took it and had it blown up. The features are not real clear, but you can definitely tell by the way he stands that he's a family ancestor. Sadly Wilhelm was kicked in the head by a horse and died before my grandfather was born. Poor Great Grandma was a bride, a widow and a mother all within 1 year! My great grandma was a great woman of faith. When she prayed for people they were healed immediately. My dad has told of so many healings because of her prayers. I can't wait to someday meet these family members in heaven! to see other people's Black and White Wordless Wednesday photos. Click on the button above to join OhAmanda and others for Top Ten Tuesday. Here are 10 of my favorite places to eat. 1. My Mom and Dad's House - my mom is the best cook bar none. I love to eat anything she fixes. Some of my favorite are her cheesy nip chicken and she makes the best mashed potatoes, and dumplins are another favorite. 2. My Mom and Dad's House - my dad is the 2nd best cook bar none. Actually dad was 22 and mom was 17 when they married. Mom couldn't cook except for like 2 things. Dad taught her to cook. Dad makes the best peanut butter fudge anywhere that I've ever tasted and he makes awesome baked kushaw. It's kinda like sweet potatoes only better. Again, everything he makes is awesome. 3. J. Alexanders - love their prime rib and salads. 4. Red Lobster - love their fried shrimp and baked fish. 5. Outback - love their steaks and prime rib. 6. Boma - this is an African themed restaurant in the Animal Kingdom Lodge at Disney World - We ate breakfast here. The food was great and the atmosphere was so neat. 8. Dixie Crossroads - this is in the area of Titusville, FL. It's a really great seafood place. I love their hushpuppies and fried shrimp. 9. Dixie Stampede - this is a dinner show I've seen in Pigeon Forge and Myrtle Beach. It's a really fun rodeo type of show and the food isn't bad either. It's just a fun place my family loves to go every 2 or 3 years. 10. La Comedia - This is a dinner theater. I'm going next week with my daughter to see Camelot. The food is really good, but the best part is the life stage play. Very professionally done and a lot of fun. It's been a good day. I haven't done anything or gone anywhere. I've just stayed home and relaxed. My husband took the girls to Walmart to get some prints made of some pictures for my daughter's science project and then took them out for Chinese. They loved it! Guess what? I loved it too. I just stayed here and ate a leftover piece of pizza (shared it with the dog) and read a book and played my computer game and caught up on reading blogs and my facebook. Usually we're gone a lot on Saturdays, but every now and then I like a day like today. Now I think the girls and I will watch a movie and maybe work some on the science project and just relax for the evening. If you didn't see last night's show, you might not want to read this post. It was another good show last night. The challenges were fun to watch, but a little violent. Couldn't believe JT lost his tooth. The Charmin Cafe along with letters from home was cool. I was a little concerned when Taj clocked out. Thought for sure she was going to get voted off for that. Glad she didn't though. Of the 2 I'm glad Spencer was the one voted off, mainly because I want to see if the cross-team alliance with Taj, Stephen, Brenden and Sierra will last. I think it's so cool they have both idols. I just hope they don't give themselves away. What are your thoughts? Have you picked who you want to win? Right now, I'm leaning toward JT, I think. This picture is from our trip to Tennessee in December. My husband and I visited Douglas Dam and this is a picture from there. Click the SkyWatch button above to visit other beautiful skies from all over the world. Top 10 things I enjoy doing in my off time (not in any particular order). 2. Read my favorite blogs and Facebook. 6. Go out to eat with my family. 9. If I'm tired or had a particularly hard day, I like to veg in front of the TV for a little while (just so I don't have to think too hard). Man, I sound pretty boring!! Oh well, it works for me. 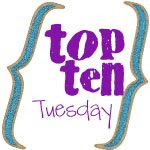 Click on the above button if you'd like to join others for Top Ten Tuesday! Last night at church we were discussing the nature of God and one of the ladies mentioned this song and it's been on my mind ever since. I found the words and wanted to share it with you. 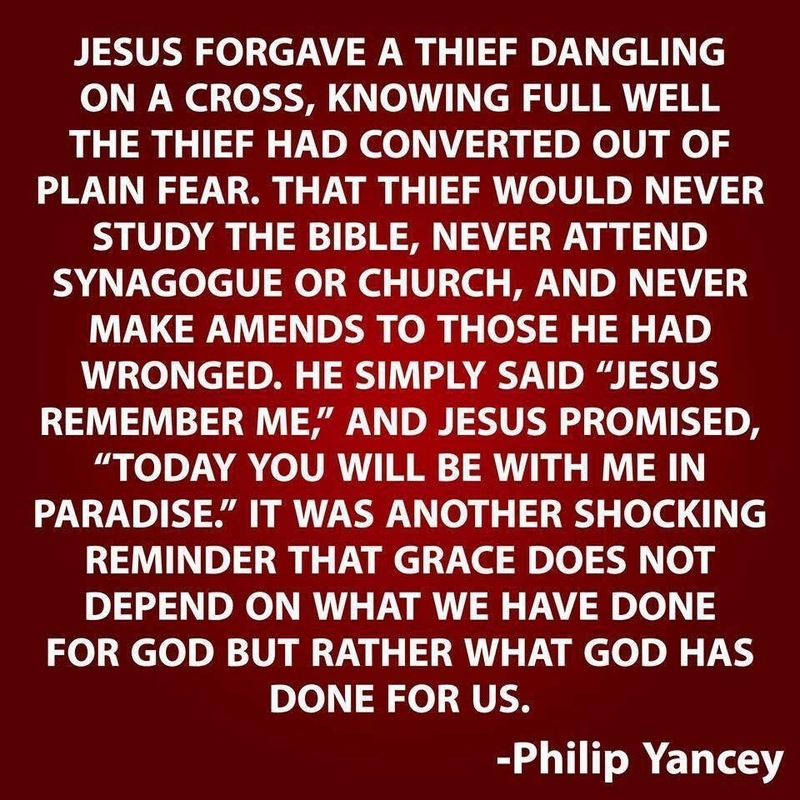 I especially love the third verse. Survivor-I did not give away the ending! I promise (with my right hand on my heart) I will not give the outcome of last night's Survivor in this post. :) It seems that last week I ruined it for a couple of people who had TIVO'd it. However it was a fun show this week. I loved the 2 challenges. They were very physically challenging and fun to watch and I wasn't too upset with the final results of the tribal council. For other beautiful skies from all over the world, click the SkyWatch Friday button above. I'm not sure who all these people are. The woman on the far left is my grandmother (my dad's mom). The tall man next to her is my grandfather (dad's dad). I don't know who the guy is standing behind them. I think the boy standing on the porch in the back center of the photo is my dad. It's either dad or one of his brothers. I'm not sure who all the other people are. I'll have to ask dad to identify everyone for me sometime. (Karen if you read this, do you know who all these people are. So last week you got to meet my mom's mom and dad and this week you get to meet dad's parents. Top Ten Favorite Places I'd like to Visit for the 1st time or again. If you'd like to join us on Top Ten Tuesday, just click on the button above and it'll take you to ohamanda's site (where Mr. Linky can be found). 2. Washington DC - been here once and totally loved all the history, especially loved Lincoln's Monument. 4. Colorado Springs, CO - been here once about 20 years ago. Beautiful! 5. Grand Canyon - I've never seen the Grand Canyon, but I so want to. 6. Greece - I've never been here. All the pictures make it look so beautiful. Would love to see it. 7. Texas - I've never been, but I have a desire to see it. Seems a lot of the blogs I read are from people living in Texas. Makes me want to go, plus hubby went to college in Texas and loved it. I just told him the other night I want to go some day. 8. Germany - I've never been. I'd love to see where my family came from. 10. Cruise to the Virgin Islands - Did this once before I was married. Would like to take hubby on a cruise to the Virgin Islands or Alaska. That's what it is here. I had flu like symptoms a couple weeks ago and then finally got better. KLS had a sore throat last week and then it went into her ears and she couldn't hear all weekend. She's finally better. Now hubby has it. He's got a terrible sore throat, stopped-up ears and starting to get laryngitis (thankfully, the Lord let him get through his 2 sermons yesterday before this hit too hard). So KJS and the dog are the only 2 that haven't been sick. It's like we're all afraid to get near each other in case we pass it on again.